I don't know many things. And as the saying goes: "The more you know, the more you don't know." I list things I am learning and want to learn in a Trello board. 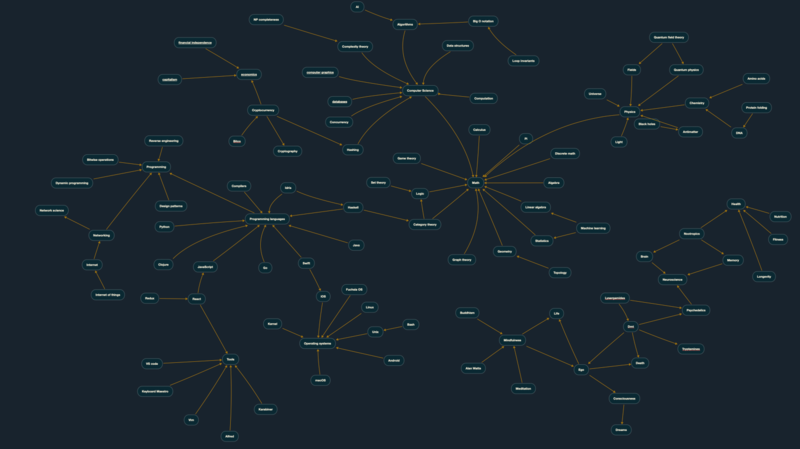 I also visualize some topics and their relations as an interactive mind map. I index knowledge for fast retrieval as I cannot rely on my memory and I want to focus on solving problems rather than try keep all and everything in head. What I need to do, what my plans are for the future, what projects am I working on, what I know or want to know and this list goes on. I solve this problem in multiple ways and I change my approach as I find better ways of doing things. I keep Learn Anything as a way to quickly find what is the most optimal way of learning some topic and I keep most of the useful learning links there as it is incredibly easy for me to find things there as I just search the topic and find the resource I need. Everything good should ideally be already there. For indexing my own knowledge, I transcribe what I know in this knowledge wiki here. If I want to make a longer post on something worthwhile, I make a blog post and share it on Medium where all the other people can read it. I also started making YouTube videos as I find the video format is often superior to just text and words. And I also have my mind maps which are incredibly flexible and have the advantage of being visual in nature thus not only do I get to write some words but I can link these words together. I can add images, link these images to words and the list goes on. Mind Maps for me are the ultimate playground where ideas and thoughts and concepts get transcribed. I also parse all these mind maps for super fast access with Alfred My Mind. Thus I can get to any piece of knowledge in less than 2 seconds at any given time because I know where something is placed and I have the powerful search in front of me. For all the other things, I use a search engine of my liking. I still prefer to use Google as it does make superior searches at the cost of my privacy but I also use DuckDuckGo for both privacy and their awesome instant answers feature. I think they complement each other really well. And of course this system of knowledge indexing is really flexible and I am experimenting with these things as I go. I want to focus on writing code and writing solutions with code to real problems that exist in this world and this above system of knowledge indexing helps me greatly with that and I build and augment it with software where possible. Take whatever you’re good at and just try to push your understanding deeper. ​Don’t assume it’s difficult until it is. ​Great insights - Also has great learning page.